We all some times think the struggle is over, often times the struggle has yet to begun. Give a listen to Mos Def just express himself as we can do . Get with it ! Peace ! "Free the Jena 6 by Jasiri X"
People. When I heard this song, I have to honestly say that this was a song that was well put. Tell us what you think ! Now we have to give a big shout out to one of our loyal readers and fellow blogger for superb journalism. Check out this footage of Mycheal Bell. Check the record.. Its time to party with a purpose. On october 17th it will be a monumental night when Divadom Entertainment along with their celebrity friends invade the walls of SUGARHILL to raise money for a greater cause. 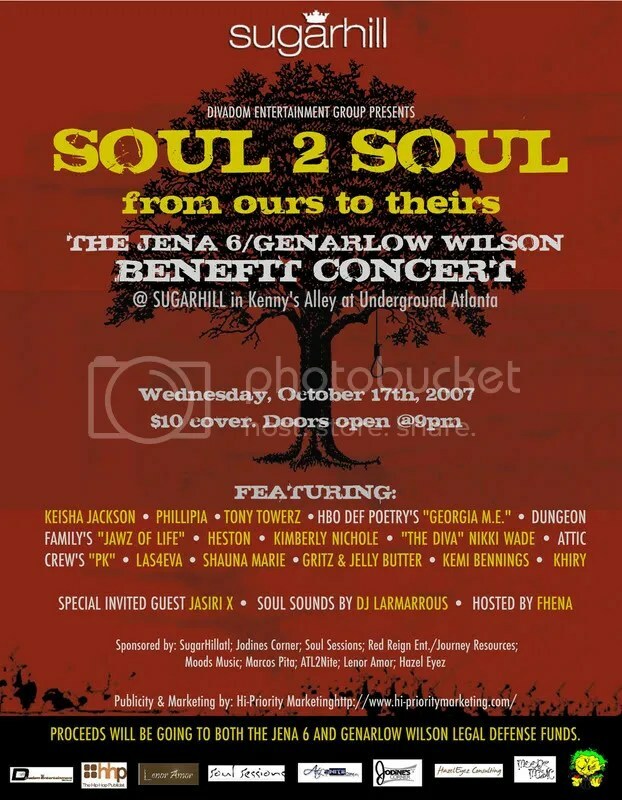 “SOUL 2 SOUL” ~The Jena 6/Genarlow Wilson benefit concert is a one time event which will take place at Sugarhill Night Club, located in Kenny’s Alley at Underground Atlanta, on Wednesday October 17th, 2007. Show will begin at 9:00 p.m with a cover charge of $10.00. Divadom Entertainment Group is very excited about the prospect of your participation in this show. We hope this has piqued your interest, and look forward to your potential support on the 17th of October. Usually we would not like to fill your inbox on different issues that are coming up on a daily. We would like to send you information all at once weekly or bi-weekly. Due to the major news with the Jena 6, We would like to offer you coverage thought the day. We are dedicated to being glued to the media outlets and some of our reporters down in Jena,La. How ever you may feel about this issue. We hope that you respect the coverage of us uncovering the details. 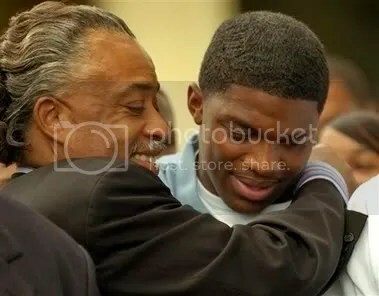 We all hope that if this was White students of Black students that you will have the same sentiments about this case. Several universities, business, actors, politicians and radio Disc Jockey have taking action in utter support of this case. As told to “My Urban Report”, there has been little to no coverage of Jena 6 in California. You are currently browsing the archives for the Jena 6-Coverage category.